With Sal Valentinetti from "AGT"
Performing music from the Swing Era to the Rat Pack Stylings of Frank, Dean and Sammy. 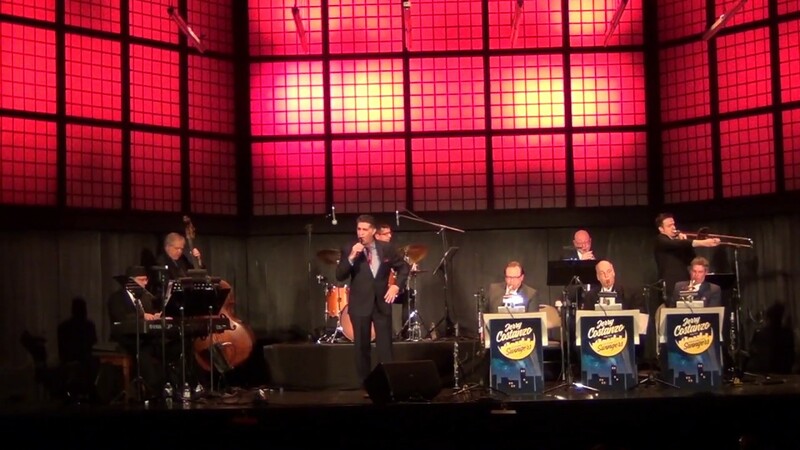 Jerry has gained popularity among fans of jazz & swing, young and old alike. 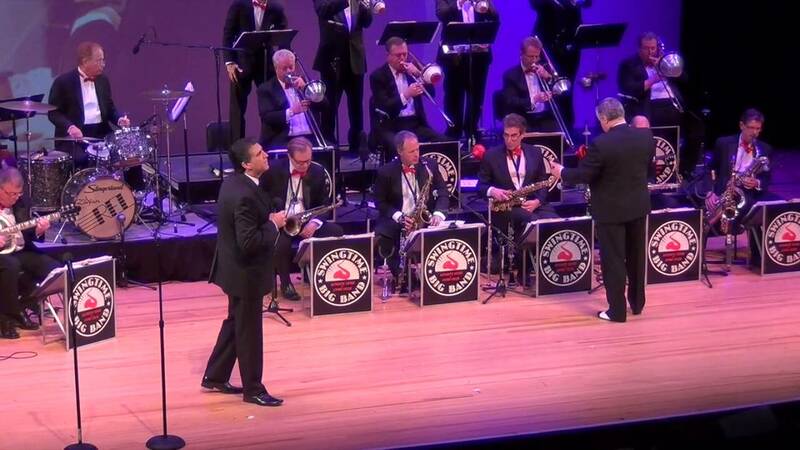 Jerry's interpretations of tunes from the golden age of song, plus the sight, sound, and music of the great big bands, sets the stage and carries his audience back to an era when this sultry and swinging music was the "Pop" of the day . Available with Trio, Quartet, Quintet to his full 9 piece "Gotham City Swingers" orchestra. Jerry also performs SOLO with backing tracks. Ask about our Band/DJ Packages. It's a great way to turn up the heat after a few hours of Sophisticated live music. Weddings, Corporate, Dances, Concerts.. I was apprehensive booking a band sight unseen only having the benefit of video as a sampling. However, Jerry and his band are extremely professional and super talented! Very responsive to email, easy to work with, on time and all-around excellent. Our guests danced the night away and thoroughly enjoyed the music. Jerry performed as a one man band this past weekend at my grandmother’s 90th birthday party and he was fantastic. I knew he would be good based on the video clips on his GS profile page, but his live performance was even better than expected. His voice was great, his Sinatra/crooner repertoire is extensive (the birthday girl was lobbing in requests and Jerry performed them all with ease), and the quality of the accompanying music and sound system was perfect. Jerry effortlessly engaged the crowd - a diverse mix of young and old - chatting to folks between songs as he walked around the venue and made sure people were enjoying themselves. Everyone had a blast and was very impressed, myself included. On top of that, Jerry was super easy to work with from start to finish – responsive, flexible, and easy going, and he arrived and got set up right on schedule the day of the event. He is a talent and a true professional and it was a pleasure working with him. Thanks again, Jerry! It was a perfect evening! Jerry is charming and has a wonderful voice. He sang Sinatra, Bobby Darin & had matching music during his breaks. Everyone loved him. Very engaging with the crowd. We will definitely have him back at our club! With over 30 years experience in the music entertainment industry, both as a record promoter, and entertainment booking agent. I have come across hundreds of singers, entertainers and bands. Many among my roster stand out. One such stand out is Jerry Costanzo. Not only a great singer, and bandleader but someone I can always count on to go over and above for my many distinguished and discerning clients. Whenever the event requires great male vocals in a jazz ensemble, or big band setting, Jerry is my number one go to guy. I wanted to send you my sincerest gratitude for the excellent job you and your ensemble did at my mother's party Saturday night. The music was fabulous! The guests LOVED you and the band. Everything was so perfect! Every single person asked me where I found you and asked for your contact information. My brother said he could listen to you all night as could grand nephew!!! I can not thank you enough for making the party exceptional! Our company was having a 65th anniversary celebration and we decided on a Swing, Big Band, 1940's Era Themed event. One of our employees told us about Jerry and his Gotham City Swingers. We reached out to him and from the very start we knew we found the perfect band for our event. Jerry worked with us every step of the way and even helped us secure a Baby Grand piano and brought in professional swing dancers to put on an exhibition during the dinner portion of our event. Jerry's voice was unbelievable. The band was polished, top notch professionals. Our people are still talking about the party. I can't say enough about Jerry and the band, and we are planning on having them back for our annual holiday party. Jerry was a hit when he performed his Rat Pack Tribute show in celebration of a 100th birthday at Atria Glen Cove! He has a wonderful voice, great enthusiasm, and catered to all in attendance! I will certainly be booking him again! We had been at our aunt's wedding about five years ago, and we recalled all of the positive comments about Jerry. So, we decided to hire him for our event. Needless to say, he was friendly, entertaining, and accommodated us with songs we had requested of him. He has a nice way about him and we received wonderful "reviews" from our family and friends. Jerry Costanzo & His Gotham City Swingers are extremely professional and talented. His flawless voice and high energy performance will keep the audience wanting more! Amazingly entertaining! From the moment I started to inquire about entertainment with Jerry, he was friendly and informative and easy spirited. My party was truly completed by his live entertainment. His warm personality and his fantastically smooth voice truly "wowed the guests". I had guests that ranged from the 25 year olds thru the 80 year olds and everyone sang, swayed and danced with Jerry. My party was a huge success and Jerry brought it all together!! We hired Jerry and his nine-piece band for our wedding. Not only did the band sound unbelievable and Jerry kept the party going perfectly, it was a breeze working with Jerry in the lead up to the night. He was incredibly professional - returning emails promptly, working with us on the song list , the first dance (a medly of Moonlight Serenade and in the Mood). We felt completely confident because Jerry has so much experience and enjoyment in what he does. Thanks Jerry! Price Range: "$250 and up"
Sophisticated, Elegant, Engaging and Versatile… These four words best describe Jerry Costanzo and his Groups. 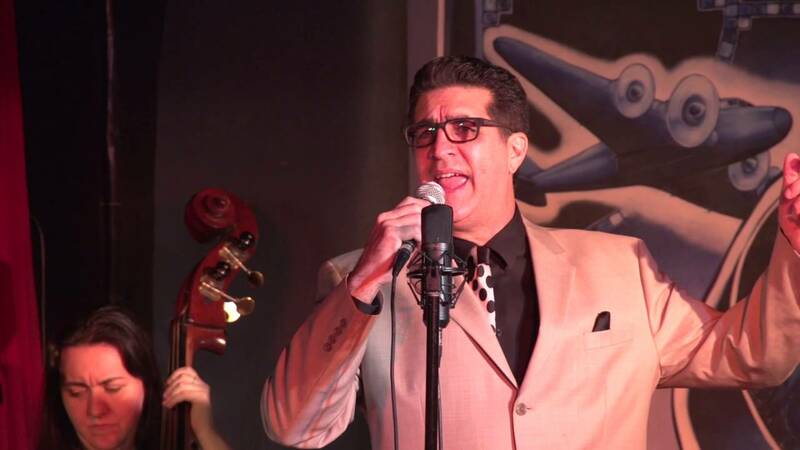 Vocalist and bandleader Jerry Costanzo has been performing in the New York tri-state area Since 1995. 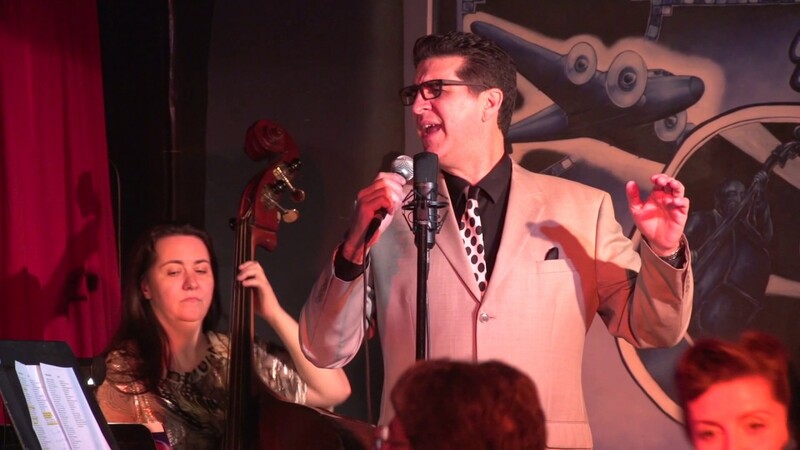 As a seasoned veteran of the New York music scene, Jerry knows exactly how to make your event or wedding a success, Jerry works with New York's finest musicians to perform for your event. Whatever the event, if you are looking for jazz, swing and the best of the “The American Song Book”, Jerry will not disappoint! Jerry’s large repertoire of music allows him to take any request, and if you want a special arrangement, Jerry is more than happy to accommodate. In another time and place, Jerry Costanzo wouldn’t be interpreting the Great American Songbook. It’s likely he’d be conceiving it. "The Midwest Record" deemed the luminous vocalist and bandleader “A cat that knows how to swing it and grab the Vegas vibe that most of us never were old enough to experience,”while Jazz.com raved, “As all great singers do, he tells a story.”Raised in a musical family, Costanzo’s musical stencil was etched with the likes of Sinatra, Sammy, Dino, Perry Como, Nat King Cole. He was playing saxophone by third grade, and developed chops as a performer studying acting at New York’s Herbert Berghof Studio. A stint as personal aid and chauffeur for Al Pacino further apprised Costanzo to the arts, before he joined his father Joseph’s big band, The Memories Of Swing, first on sax and then as the outfit’s lead vocalist. While well into his 30s before the New Yorker recognized his calling card—bringing his musical idols back to life—Costanzo is making up for lost time. Today, the man behind the mic is a full-time troubadour and bandleader, surrounded by a Who’s Who of the jazz world. In 2008, his debut full-length album “Destination Moon,” served up a dozen swigin` classics, “Moon” earned Costanzo a dedicated live following, with gigs including the Annual Sinatra Birthday Bash at The Count Basie Theatre in Red Bank, N.J., Lincoln Centers Mid Summer Night Swing, New York’s Metropolitan Room, Feinstein’s at The Loews Regency, Swing 46 Jazz & Supper Club, The Iridium Jazz Club, Jazz at The Kitano Hotel, The Waldorf Astoria, The Long Island, N.Y., Tilles Center for the Performing Arts, Hofstra University’s John Cranford Theater, The Suffolk Theater, The Harry Chapin Lakeside Theater, The Dix Hills Performing Arts Center and dozens of concert series, festivals and private posh gigs nationally and worldwide. Chuck Taylor served as a writer and senior editor at Billboard magazine for 14 years. He has appeared on CNN, ABC’s “20/20,” VH1’s “Behind the Music,” A&E’s “Biography,” and been quoted in the New York Times, USA Today and numerous publications about music. 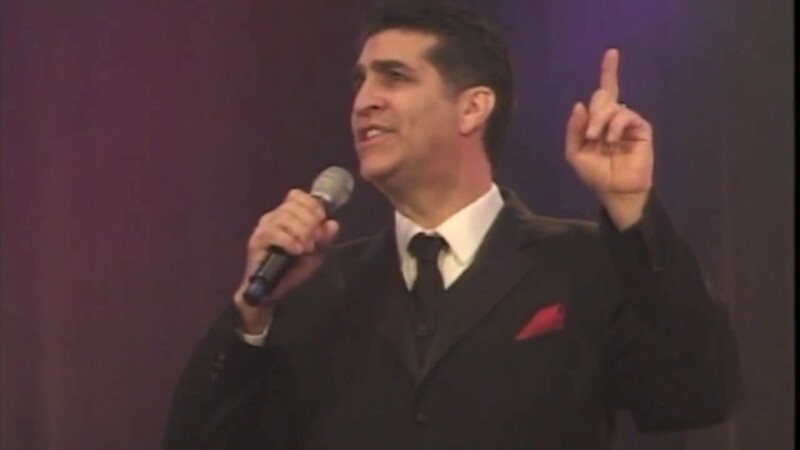 Jerry's Repertoire consists of over 200 Standards, drawing from the "Great American Songbook" To include the Songs of the Great Big Bands, Songs of the great Singers like- Sinatra, Dino, Tony Bennett, Nat King Cole and much more. Requests are always welcomed and encouraged..
Jerry draws his energy from the great singers and crooners of yesterday and today. His biggest influences are acts like Frank Sinatra, Dean Martin, Sammy Davis Jr, Louie Prima, Bobby Darin, Nat King Cole. Plus the great Big Bands like, The Count Basie Orchestra, Duke Ellington, and Benny Goodman. Bandleader’s arrangers and composers like Nelson Riddle, Billy May, Don Costa and much much more. Thanks so much for the great job that you all did on Saturday night. Tom and I are both so happy and so thrilled that our friends and family had such a great time. The entire crowd raved about the music and the party. Jerry, everyone loved your songs, and the general format with you singing and alternating with the DJ...the whole thing was perfect. The song selection was perfect too. A little Frank Sinatra and a Little Lady Gaga. It doesn't get better than that. I think Jerry & his Band were fantastic! I love Sinatra's music & Jerry has that feel. Professionally- Jerry & his band sounded amazing! I don't know if you've heard Jerry sing before, but he has one of the smoothest voices around. It is rich, warm, and fills the room, but not piercing. His musicians in the band were top notch guys from Manhattan who were all professional players, not just once a month guys. You can really tell the difference! Additionally- I found Jerry through a website search (lucky for me) Jen & I wanted to have a certain feel at the wedding which would require a live band, and we also wanted to dance the way WE dance. She had initially contacted several bands in the city and they and they all wanted more money than I had paid for my last automobile! Then I found Jerry. As far as I know, Jerry is the only PROFESSIONAL of his type on Long Island, and he sounds as great (if not better) than most of the groups from the city.I encourage you to listen to Jerry's music. Meet with him and draw your own conclusion if his style is right for you, but don't hesitate with regard to the quality and professionalism of Jerry and his band. Jerry and his band were great. I would definitely hire them again and may even wind up using them again next year for what may turn out to be an annual golf benefit. Thanks again Jerry. Wonderful band. Guests loved their sounds. Would recommend to anyone. Jerry was as professional as they come. Thanks for the hook-up. One of the best singers of the standards I’ve ever heard, I would highly advise anyone to use him! He’s a class act . Jerry and his band were exactly what we had dreamed about for our wedding. His voice is excellent and he has a variety of options for ensemble sizes. We had a wonderful American Songbook evening with some mixed dance thrown in for fun. I would highly recommend Jerry because he really listens to what you want and like, and does a great job. We had many compliments on his band from our wedding guests. Our Country Club's 1st Annual Special Membership Recognition and Appreciation Dinner Dance was a huge success largely in part by Jerry Costanzo's Band. With such a diverse membership, ranging in ages 20 - 96, we needed a band that would be able to "feel the essence" of the evening and be spontaneous and accommodating. The Jerry Constanzo band did just that. They were highly professional and entertaining. Our members were extremely happy. We would definitely welcome them back! From beginning to end, I found Jerry very approachable and accommodating. He was quite flexible with the plans for our event, which seemed to change like the wind. With respect to the event itself, everything worked effortlessly... they arrived promptly, set-up with minimal fluff and then performed better than expected. The mix of instrumentals and vocals was quite right, and the blending of holiday tunes was perfect. Though I am not an expert in things musical, I was impressed with the quality of the sound - seemed like something you'd find in a high-quality niteclub in New York. The band agreed to play longer than for what we'd agreed and did so quite happily. All in all, these guys are great, and I recommend them highly. WOW!! I gave a 60th Anniversary party to my parents, and many guests were in their 80's. I also invited their children, and grandchildren, and there were times when almost every person in the room was up dancing!! To see people in their 80's and 40's and 20's dancing side by side and laughing and smiling was fantastic! The owner of the banquet hall heard the band and came down to our room to ask me who was this band, and how could he contact them! Every guest asked me where we found this 17-piece Big Band. Jerry Costanzo transcends generations. Grandchildren were asking their grandparents to dance! I saw guests with tears in their eyes many times during the evening. This Big Band was professional, talented, and Jerry makes eye-contact while he's singing and is very charming. I have sailed on the QE2 and on the new QM2 cruise lines, as have many of the guests, and Jerry Costanzo's Big Band tops every band we have ever heard! They have my highest recommendation.